Pre-wedding photo shoots were never a part of traditional Indian wedding rituals but with increasing global exposure it has found its way in Indian weddings. A few of the accomplished photographers shared with me that these photo shoots are the most paying assignments apart from wedding ceremonies. In just a matter of 2 years, pre-wedding photography shoots in Jaipur has seen a massive leap. Jaipur rates high among the best places for photo shoots in Rajasthan. It is difficult to not find a pre-wedding photo shoots at heritage locations in Jaipur during morning hours. A frustrating experience for the travelers & tourists; they find it difficult to capture a picture of tourist attractions devoid of the “photography troupe”. Jaipur has many beautiful heritage locations, and this is one reason they consider Jaipur as a top pre-wedding photo shoot location in India. A while ago, one found merely locals undertaking it but now couples from the rest of India also prefer pink city for the beautiful backdrop of heritage buildings. Here are top pre-wedding photo shoot locations in Jaipur. Albert Hall Museum is one of the most desired places for the pre-wedding photo shoot in Jaipur. What makes it most popular? The accessibility of the location and graceful amalgamation of three architectural styles. The pigeon feeding spot in front of the Albert Hall museum remains the most popular spot for the photo shoots. Being a protected heritage monument wedding photo shoots are not allowed in the museum section. Patrika Gate features among the top Insta-worthy places in Jaipur. The best part is photo shoots require no permissions. Patrika Gate is at Jawahar Circle near Sanganer Airport and accessible throughout the day. It definitely makes for an excellent background. Vidhyadhar Garden at Ghat Ki Guni is one of the oldest Char Bagh patterned garden in Jaipur. Recently restored & renovated, Vidyadhar Ka Bagh is one of the finest Rajput versions of Mughal garden. What makes it different from other such gardens? The layout is not in a square shape rather the designer of the garden has tried to utilise the space in the best way. Tip: Vidhyadar Ka Bagh has a restaurant too! Once Upon A Time At Bagh is operated by the same company that manages Once Upon A Time At Nahargarh. Overpriced food is nothing to write home about, like 1135 AD in Amer Fort and Once Upon a Time At Nahargarh. However, the interiors will make for a great backdrop. Perched at the end of a cliff overlooking the city definitely makes Nahargarh Fort a stunning location. This place is popular among couples and therefore it is not surprising why it continues to top as a preferred place for the photo shoots in Jaipur. Charan Mandir though not a popular place with the tourists but that’s not the case among the locals. Some views around Charan Mandir are stunning. One of the most popular reasons for this being a top-rated place among couples is that one can get a stunning backdrop of Jal Mahal or the Water Palace. It is less crowded during the early morning hours. They filmed many successful Bollywood movies in Kanak Vrindavan Garden in Kanak Ghati during the 1990s and early 2000. Hindustan Charitable Trust restored this 300+ years-old garden in the 1990s. The garden represents a discerning amalgamation of Rajput architecture and Persian style Char-Bagh. What adds to its beauty is the serene atmosphere as it is in a picturesque valley with hills on one side and Man Sagar lake on the other. Amer Fort is synonymous with Jaipur and one of the top tourist attractions. A photo shoots inside the palace section will require permission, and it is a protected monument. Most tourist places don’t permit tripod and other professional types of equipment. But a photo shoot in Jaleb Chowk, pigeon feeding spot near Maota lake, or Dil-Araam Bagh won’t require any express permission. City Palace boasts some of the most popular Instagram worthy places in Jaipur especially the four gates in Pritam Mahal. City Palace is owned by the descendants of the Jaipur royal family. One can examine the private sections of the palace by purchasing a premium ticket. Prior permission is a must for the photo shoot unless you are planning a casual photo shoot with just one photographer. Like Patrika Gate, Jal Mahal too is accessible throughout the day and requires no permission. Although shoots are popular during the early hours, the true beauty of Jal Mahal structure comes alive during the evening when it is beautifully lit by the setting sun. There are no entry charges as this is a public place and free for all. Panna Meena Kund step-well has lately shot into fame because many travelers have featured this place on their Instagram feed and blogs. While previously, one could walk down the water reservoir through the steps, now it’s prohibited and guards ensure the compliance. There are many beautiful hotels and resorts in and around Jaipur. A few are heritage properties, the rest are newly built in local architectural style replicating the grandeur of yesteryear. Many such resorts and hotels are in Kukas on NH 8. Among these, Hotel Fairmont remains a leading place for photo shoots. It is also a popular choice for the destination weddings in Jaipur. Hotel Rambagh Palace-Rated as one of the most splendid heritage hotels in India repeatedly, the Taj hotels manages this erstwhile home of Jaipur royal family. Like the Taj Mahal Hotel in Mumbai, Rambagh Palace too is an iconic property with a fascinating history. Rambagh is one of the top wedding venues in Jaipur. This place provides a venue for the Jaipur Literature Festival social evening for the guests, writers, authors, and speakers. The hotel doesn’t permit walk-ins for the photo shoot. The best way? Book a room! Hotel Jai Mahal is an old palace converted into a hotel; it has the old world charm. It is not as grand as Rambagh Palace in terms of size and architecture but it has its own beauty. Poolside and the jumbo chess board are some popular places for the pre-wedding photo-shoot in Hotel Jai Mahal Palace. Some other notable properties for pre-wedding photo shoots near Jaipur are Samode Palace, Le Méridien, Alila Fort Bishangarh, Chomu Palace, Raj Mahal Palace, and Rajasthali Resort. Birla Mandir a temple made with white marble offers a stunning background for pre-wedding photo shoots. A big plus to consider is its prominent location and one of the best places for evening photo-shoot. They do not permit photography inside the temple. Sisodia Rani Garden is a heritage site with Char Bagh style Mughal garden. The place has notable environs and makes for a fantastic backdrop. The hills all around add to its charm. Sisodia Rani Garden is a ticketed entry. Apart from these heritage sites, there are some cool cafes and eateries for the pre-wedding photo shoots. While it is impossible to list them all, the one which is most distinctive and unmissable is Bar Palladio with its peacock blue interiors. Instead of describing the place, I will let the picture do the talking. These are just a few in the long list of places for a pre-wedding photo shoots in Jaipur. It is hard to find a city that offers such a plethora of places and this is one reason they rate Jaipur as the best pre-wedding shoot place in India. Do these locations serve as wedding venues also? Some of them do. Like Kanak Vrindavan garden. A while ago even Sisodia Rani Garden was popular for weddings but now the authorities have stopped doing so. I think it is a good move because commercial use of such sites cause a lot of damage to old structures. With so many wonderful heritage sites in Jaipur your town can be easily named the capital city of pre-wedding photo shoots of the entire world. 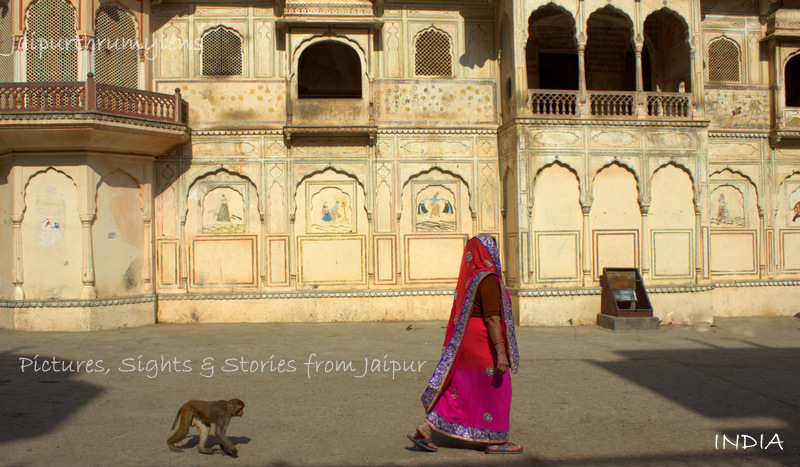 For me your post gave me further insight into the cultural richness of Jaipur. I agree. There are many beautiful heritage sites in Jaipur. They look beautiful as a backdrop. Considering the fact that couples would want something to cherish forever with pictures, it is a visual treat. I’m not sure if it can be called as capital of pre-wedding shoots of the world. What are preferred places in Canada among the couples for pre-wedding photo-shoots? Mel! For a traveler, witnessing a wedding procession is an authentic experience; something that is hard to find when we travel. I have seen so many hotel guests walking in a marriage ceremony out of curiosity here in Jaipur. The hosts are happy to invite them as well. Did you have such an opportunity? Where in India? I’m happy you were able to experience it in person. People don’t mind if you are not dressed for the occasion because they understand. Where are you based? You got it right, Sarmistha. We have chosen the consumerism so every moment can be sold! On another note, do we have time to pick up old photo albums? Exactly, Arv we hardly have time to look back to anything thats past and forget about albums. Although it is a debatable topic but I really wonder how these photo shoots grabs unwanted attention to something that is personal and also becomes an eye sore to the tourists and other visitors who are also there to capture their memories of visit to any place. I guess these pictures are a great reminder of the “happy-times” that vanish over the years! .. LOL! You know what I mean with reference to the “wedded bliss”! Personally, I don’t think we need to blindly ape other culture. We have such a rich cultural history. Don’t you think so? Arv, hahaha first of all I completele agree to your point of the so called “happy-times”. Its really sad that today people blindly ape other culture leaving behind our own and this trend is spreading like an epidemic. I voted for you in Annual blogger bash award. Hoping this year, an Indian wins. Thanks, Sneha for the vote. Will reciprocate. Where are you based? It is done thing, Sneha! Voted. Great. So why half South Indian? No wonder! Jaipur has too many spots for outstanding photos. The colors, the angles, the shapes, the detail…they are all there! I must admit I love looking at pre-wedding photos too and it always amazes me how the photographers, stylists and coordinators are able to find the perfect place to do these shots. 🙂 I can see why Jaipur is considered one of the best too. Those places look dreamy and romantic. Plus all of the sites are culturally significant, adding a great background story to the photos itself. Marvi, I think all these people are best with what they do. They are all experts! I agree most of these places are romantic or makes for a great backdrop. You should check out pictures of Jaipur on Instagram. It is very popular city on Instagram! Ever been to India? I can see why everyone wants to have their pre-wedding photos in Jaipur, there are so man pretty spots. It looks spectacular. You bet! Have you ever been to Jaipur or India? Wow, gorgeous spots for pre-wedding or any other kind of photo shoots. I think the Patrika Gate and the Albert Hall Museum are my favourites, although I imagine they get busy. I must get to Jaipur one of these days. You definitely should, Cindy! Patrika Gate has become very popular on Instagram, lately. Albert hall being a tourist attraction does get very busy with travelers and tourists. The Patrika Gate makes for an amazing backdrop with all those pastel shades. Bar Palladio’s interiors are a design lover’s dream! I’d love to do a shot in the Panna Meena Kund. I think the symmetry will make for a fantastic setting. Mohana, the creators of yesteryear knew how to play with simple design yet create a beauty. That’s what Panna Meena Kund is. Symmetry! Bar Palladio and Patrika Gate are a visual treat too. They are more artistic. No wonder you loved it. You love all kind of art, I suppose! That’s so interesting that pre-wedding photo shoots are becoming a ritual when it wasn’t before. The power of exposure is so fascinating. The inside of Bar Palladio is just stunning. I’d love to capture some images there! I’m sure you will be happy to visit Bar Palladio. Have you ever been to Jaipur or India before, Candy? They seem to be more and more popular all over, it’s great for photographers to make a living and nice to capture memories professionally. There are some amazing backdrops here, you can see why it’s popular. I agree. It is getting popular! Where are you based? Do you see this happening in your city too? Very wonderful location. Jaipur is the nice city. As always,no one can describe Jaipur more elegantly than you do through the wide,free lens of yours. I don’t think it is about being married or single. it is about the moment and feeling. Why don’t start this trend, Neha? I’m sure Jaipur will be a great choice! Well, I’m extremely busy for last one month. And looks like it will be this way for some time! What about you? My exam just finished and that’s why for the time being a free bird(a temporary one might be). Yes,then decided. Photoshoot is happening. Awesome, Neha. Enjoy your holidays. These places are stunning and worth a visit, regardless of the reasons! We did visit Amer Fort and that place is so massive, the red and ochre perfect for any shot. That Patrika Gate is so colorful, it’s rare to see that type of contrast. Awesome list! Thanks, Patricia. I’m glad you have been to some of these places. Amer Fort is definitely one of the most popular forts in India. It has made it to the India Tourism’s list of best attractions in India. I feel the ochre color adds to its beauty because you don’t find this color on fort in any other country. Most European forts are masonry in construction. I wish you had visited Patrika Gate. When did you visit Jaipur? Jaipur is truly a photographer’s delight. Not only for wedding shoots but for modeling also it is worth. I loved the Jaipur Patrika Gate a lot. Jaipur is high on my “must-see” places when we do make it to India. And I do love seeing authentic wedding processions and engaging with folks to capture my own photos. Though I will admit (having encountered this phenomena elsewhere) that it can also be a bit trying when, as a photographer, you are trying to capture a sunset image of an historic place, but everywhere you lens points, you find pre or post wedding photographers, couples and their entourage. So many beautiful locations. My favorite is Patrika Gate, so beautiful! Previous Previous post: What Makes A Walk With Jaipur City Palace Museum Curators Unique?